This knitted neck tube is very, very light weighted as it actually only has a total weight of 70 g !!!! And it took me no time at lot to knit this yarn into a neck tube, only two evenings knitting in front of the TV and I was finished. This neck tube fits perfect to the various colour of my Autumn cloth and is excellent at keeping my throat warm and hopefully protecting me against the colds surrounding me. The kitchen has disappeared ! My old HTH kitchen has totally disappeared from the earth's surface, perhaps a bit exaggerated but it is certainly completely away from my domain. 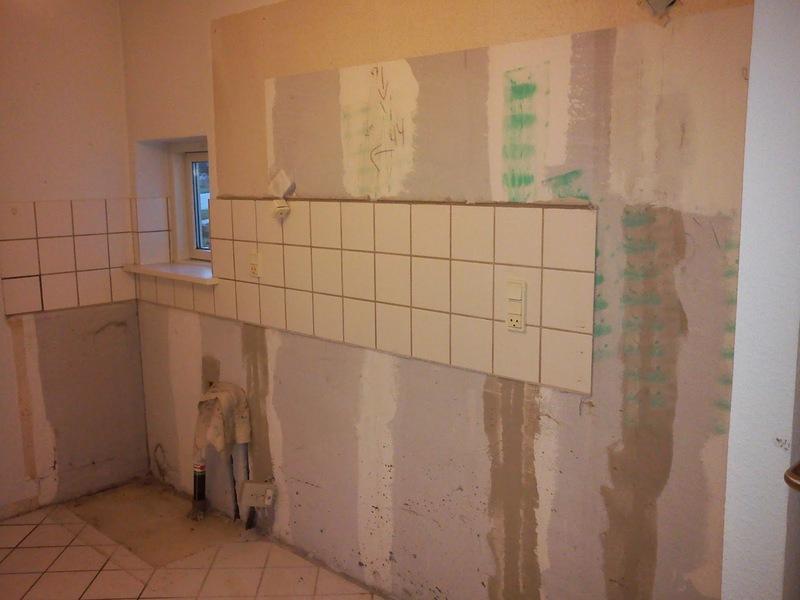 It's "only" the floor and wall tiles that are left in the kitchen part of my living-dining area. And they are now awaiting their fate, when the bricklayer comes along to remove them from my home. Theywill be replaced with a new tile floor in the next coming days. 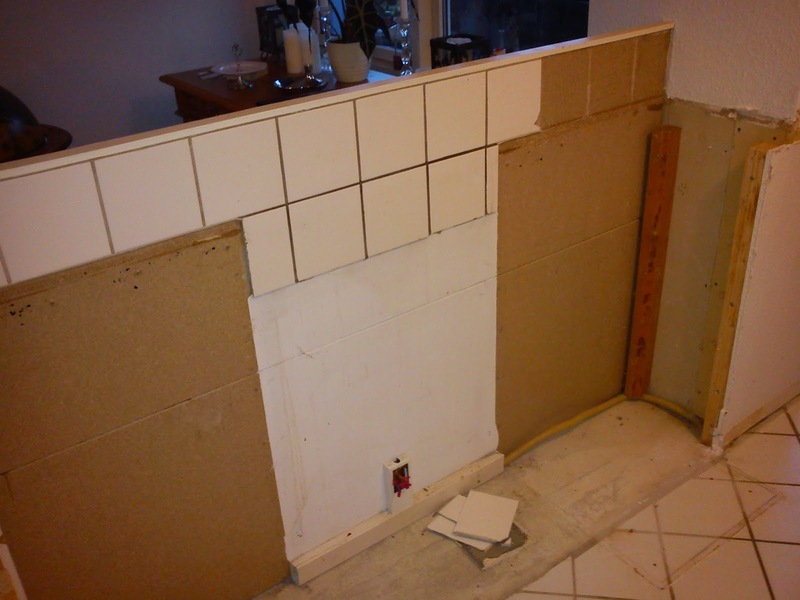 The tiles for the wall will first arrive later on. Nu er mit gamle HTH køkken totalt forsvundet fra jordens oveflade, måske lidt overdrevet men det er ihvertfald væk fra mit domæne. Det er "kun" gulv og vægfliser, der er tilbage i køkkendelen af mit stue-alrum. Og disse afventer nu deres skæbne, når mureren kommer forbi og fjerner dem fra mit åsyn. Og erstatter dem med et nye flisegulv i de kommende par dage. Vægfliserne kommer først på plads senere. A big goodbye and a huge thank you for outstanding and faithful service from my side to my old HTH kitchen and current white goods, which tomorrow Tuesday will be removed from the premises by the kitchen fitter. I have spent the last couple of days packing down all my kitchen utensils, pots, plates, glasses, cutlery and food except for the most necessary things, that I need in my "field kitchen" in the coming three weeks. My "field kitchen" is located in the bathroom. It consists of a fridge, microwave, kettle, a shallow and a deep dish, two glasses, a mug, cutting board, a set of cutlery, various knives, carrot peeler, whisk, spatula, various container for microwave cooking. Hannibal the Cat is having some difficulties understanding, where his food and water bowl has disappeared to ! He continues to go to the usual spot, where he sits down and awaits the food to show up !!!! It will certainly take much longer time to pack it all out again, when the new kitchen is ready for me to move in, as I have to decided on places to place all my kitchen stuff. The amount of stuff, which you can store in 7 m2 is unbelievable !!! All these many things are now placed all around in the house such as the bathroom, bedroom, guest room and living room. Der skal lyde et stort farvel og tak for god og tro tjeneste fra min side til mit gamle HTH køkken samt nuværende hårde hvidevarer, som i morgen tirsdag bliver pillet ned af køkken-montøren. 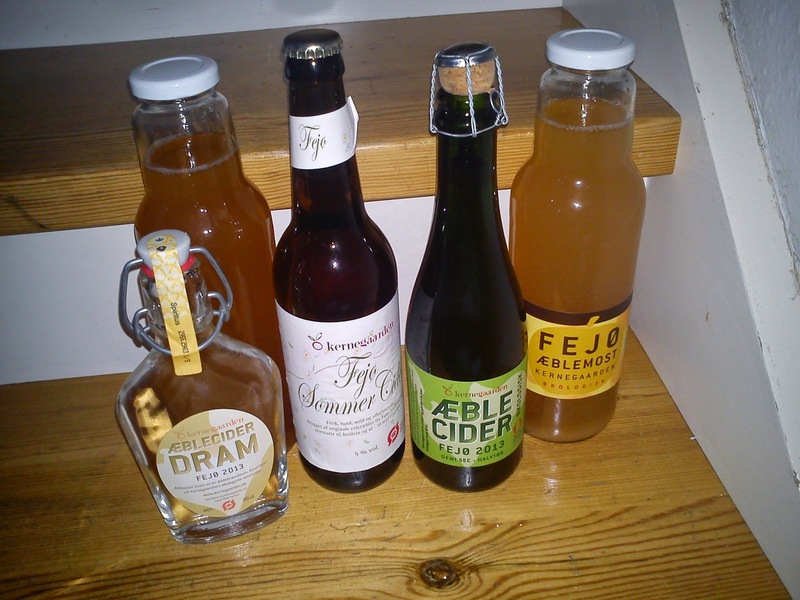 Jeg har brugt de sidste par dage på pakke alle mine køkkenredskaber, gryder, tallerkener, glas, bestik og madvarer ned med undtagelse af de meste nødvendige ting, som jeg skal bruge i mit "feltkøkken" i de kommende tre uger. 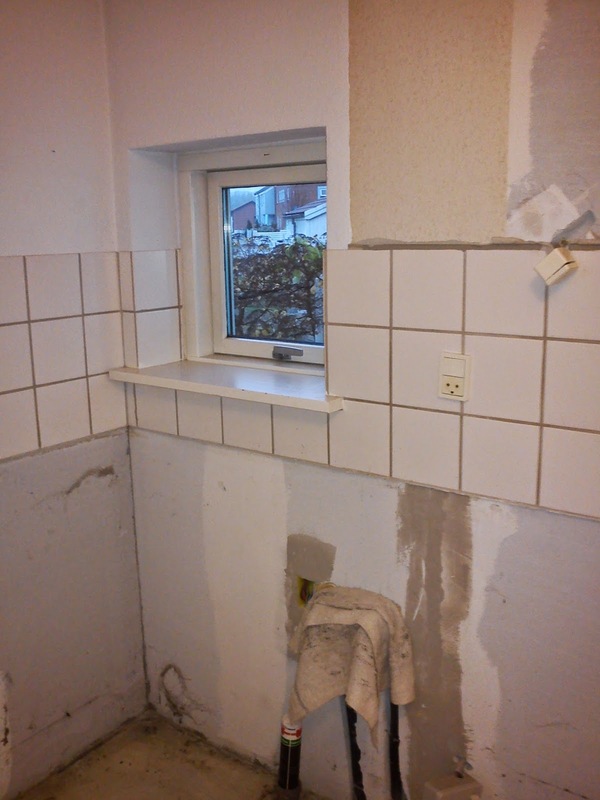 Mit "feltkøkken" er placeret i badeværelset. Det består af køleskab, mikrobølgeovn, el-kedel, en flad og en dyb tallerken, to glas, et krus, skærebræt, et sæt bestik, diverse knive, gulerodsskræller, piskeris, dejskraber, diverse beholder til tilberedning i mikrobølgeovn. Katten (Hannibal) kan dog ikke forstår, hvor hans mad og vandskål er forsvundet hen ! Han bliver ved at gå hen til den sædvanlig placering, hvorpå han sætter sig søgende ned og venter på, at maden dukker op !!!! Det kommer helt sikkert til at tage væsentlig længere tid at få pakket det hele ud igen, når det nye køkken er klart til indflytning. For så skal der jo tænke store tanker om bedst mulig placeringer. Og hvor kan der dog være utrolige mange ting på 7 m2 !!! 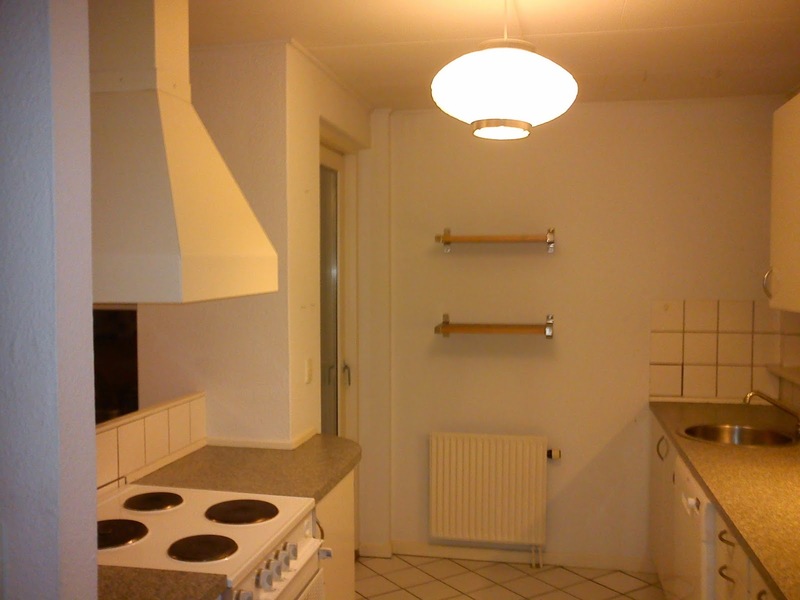 Alle disse mange ting befinder sig nu alle mulige steder rundt omkring i huset såsom badeværelse, soveværelse, gæsteværelse og stue. 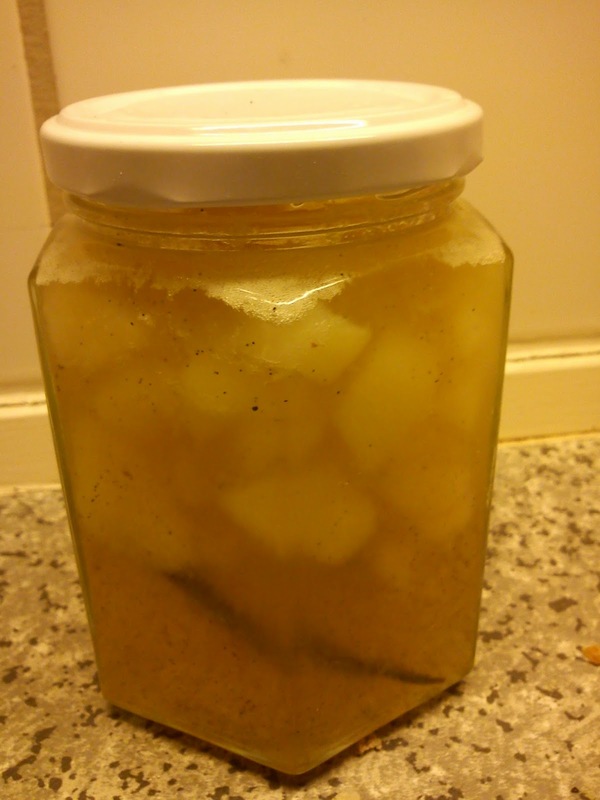 The recipe on vanilla pickled pears I have found in the IRMA magazine called "Krydderiet", issue 3 August 2014. I am living the part of Denmark, where we have no access to IRMA, which is primarily located in the area of Copenhagen, as it is more price expensive Danish supermarket chain like M&S in UK. These pickled pears can be enjoyed as dessert served together with whipped dairy cream or ice cream. Another options is to let cheese accompany these pears. Any left over pear juice can also be stored cold, and served together with pan cakes, wafers or yogurt. Put lime juice and pear pieces into a small cooking pot. Stir well, so the lime juice covers all the pear pieces, so they do not turn brownish, when exposed to air. Gently cook up everything, stir regular in the cooking pot. If you find the viscosity of the liquid part to be too thin, add in some pectin and let it boil for another 2 minutes. Prepare the jam glasses by filling them with boiling water. Another thing you can do in order to increase shelf-life, is to store the jam cold afterwards. Fill the glass with pickled pear incl the vanilla pod. Close the glass and store the pickled pears cold. My amazing work colleagues have once again participated in the annual muffin fund raising event for the fight against breast cancer as well as their positive response to this idea of mine. So a huge thank you to all of you for your support :-). As my work colleagues last year showed great support, it was an easy decision for me again to involve them. It becomes more and more easy for me to step out my own comfort zone "demanding" money from them prior to eat my muffins. Like last year I had baked muffins with Danish apples and cinnamon. As "tradition demands" I leave it to each of my work colleagues to make up their own mind on the amount of money, which they like to donate. And if they ask for suggestion, I suggest 10 DKK as starting point. I received donations from 13 work colleagues, which in total donated 297 DKK, which equals a price on 22.85 DKK for each muffin, which is very similar to the muffin price last year. As any amount of money (not fixed value) is accepted by www.araceagainstbreastcancer.dk, they have received the collected money. 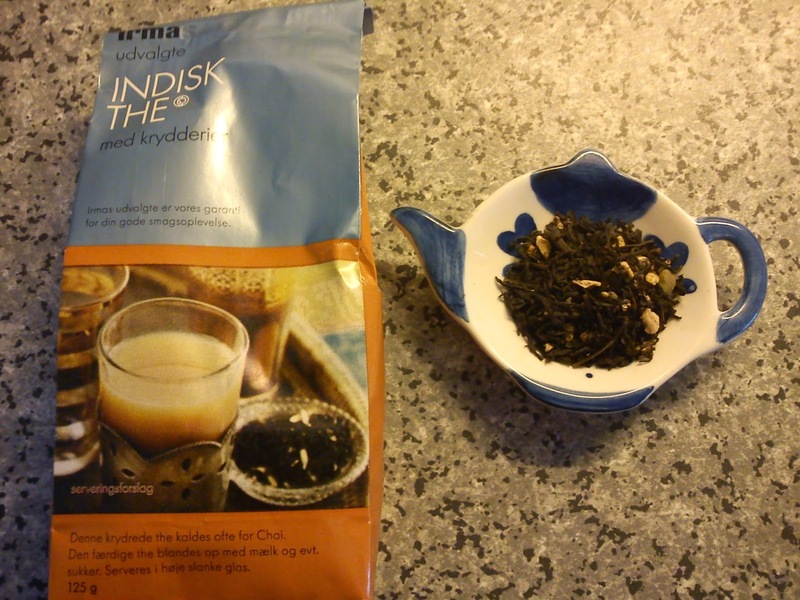 With Autumn outside my house it is good to be inside enjoying a more spiced tea in form this Indian-style tea from Irma. It is mix of tea and various spices blended from 59% black tea from India and 41% spice (ginger, anise, cardamon, cinnamon and cloves) with some anise flavour. This pasta sauce is called a "fake" sauce, because it is not containing any meat at all. I have the original recipe from a small recipe collection published by the Danish Cancer Association "Kræftens Bekæmpelse" having focus on enjoying more vegetable in our daily food. In these days, where the focus is on sustainability as well, a meat-free paste sauce could also be regarded as CO2-friendly food. Well the main reason why I like the "fake" pasta sauce is, because is tasting great and at the same time gives you an excellent filling sensation in your stomach !!! On top of that it is easy food to prepare in advance for some busy working days, as the sauce can stored in your freezer. I have been adjusting the original version by using garlic, increasing the amount of canned tomatoes and removing the basil. Heat up the oil in a large cooking pot. Add onion, garlic, celery, carrots and parsley into the warm oil. When the onions become more clear in the colour, add in the red wine. Let the red wine be reduced. Add in the canned tomatoes. Let the pasta sauce cook gently for 20 minutes under lid. 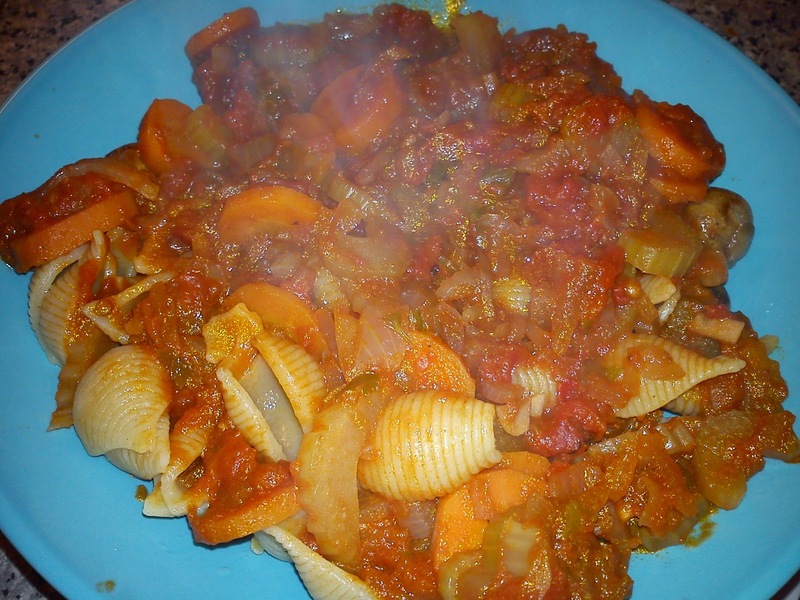 Serve this pasta sauce to paste of your choice. What better start to a rainy grey Sunday, than a Sunday Smoothie ! 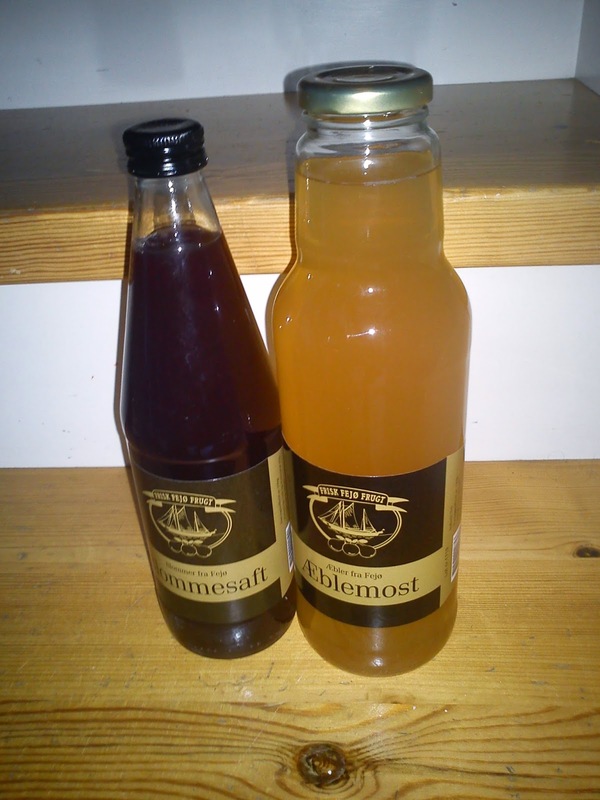 I found the original recipe in advertisement for God Morgen juice in "Alt for Damerne", and I have made no changes to it. 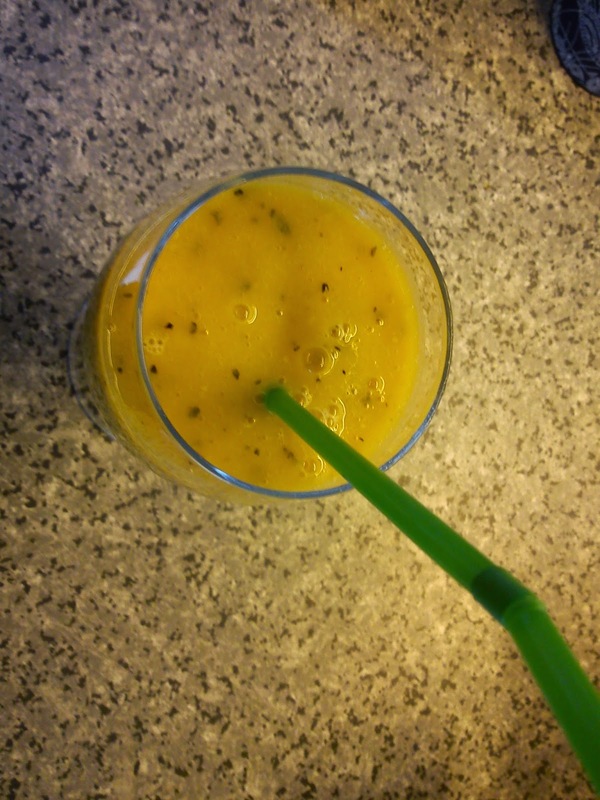 It is a great tasting smoothie combining the thick texture of sweet mango with fresh acidity from passion fruit. If you like some sweetness in the final smoothie, consider to add in ½-1 teaspoon of liquid honey and blend everything together again. Fill a glass with the smoothie and serve with a straw. On our tour around Lolland my mother and I also visited the estate Knuthenlund, which is focusing on organic food. 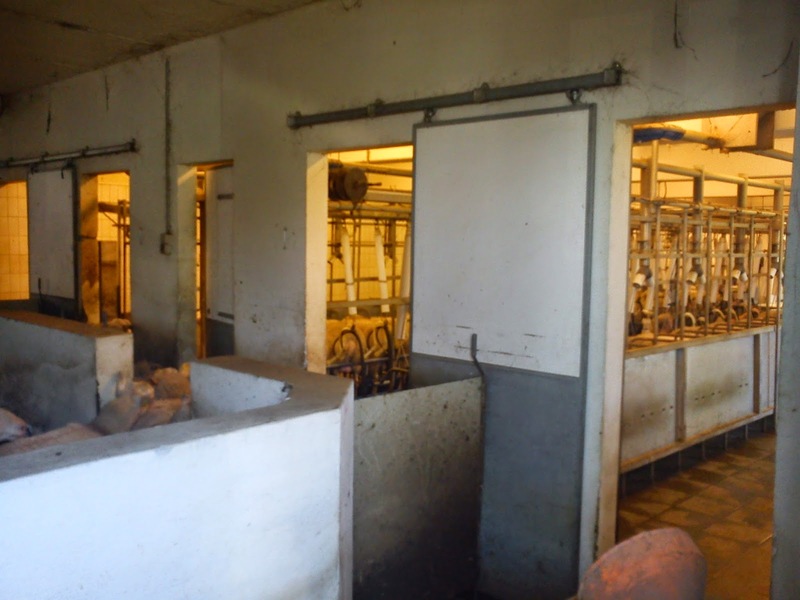 Besides from farming the land, the estate has also established a small dairy, where cheese and yogurt is produced from the milk coming from the sheep and goats living on the estate. In a small, very clean and very trendy farm shop you can see the milking of the goats and sheep every afternoon to one side and the small dairy to the other side with the farm shop in the middle. 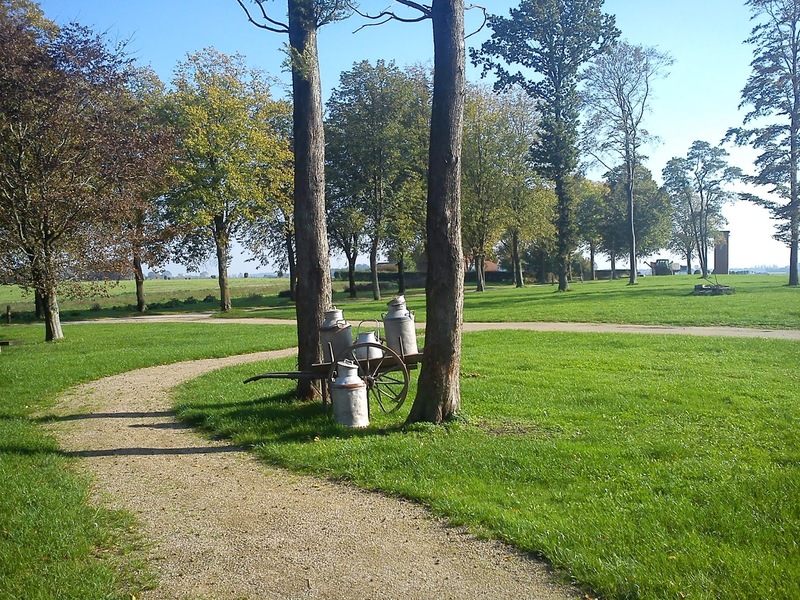 At the farm shop you can buy yogurt, cheese and meat from the estate as well as other foods produced in the neighbourhood. 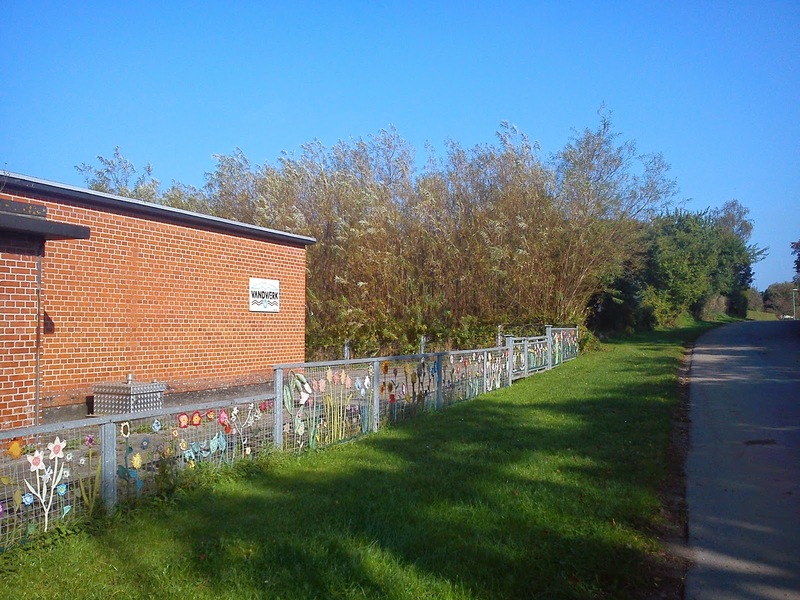 You can also enjoy coffee, tea, cake and lunch as well. It was a very nice to visit, so if you are in the area, you should take the time to visit this dairy/farm shop. 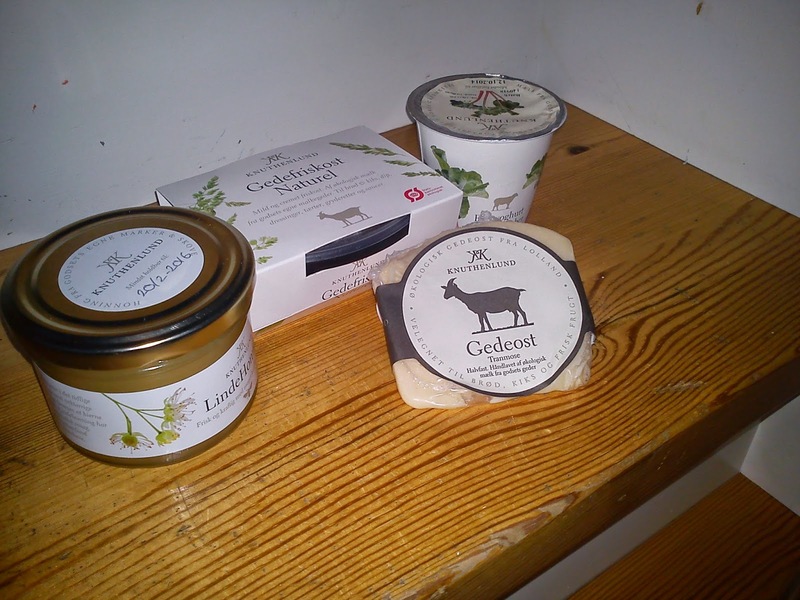 As my souvenirs from Knuthenlund I bought linden honey, fresh goat cheese, ripened hard goat cheese and a pot of sheep yogurt with rhubarb. The yogurt is very thick and creamy. 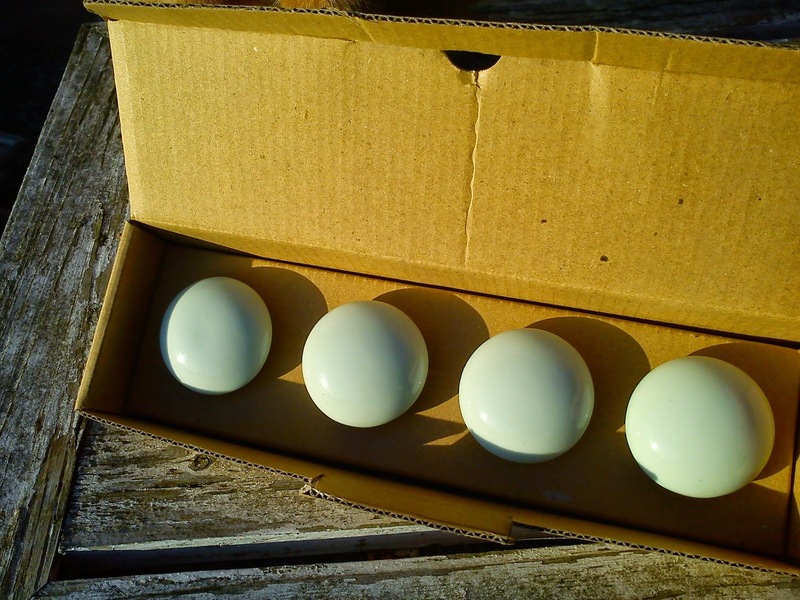 It is also made from the sheep milk as it is with a high fat and protein content. I really liked the consistency, however I could have done with a more sweet taste. My kitchen project is moving along quietly at the time being. 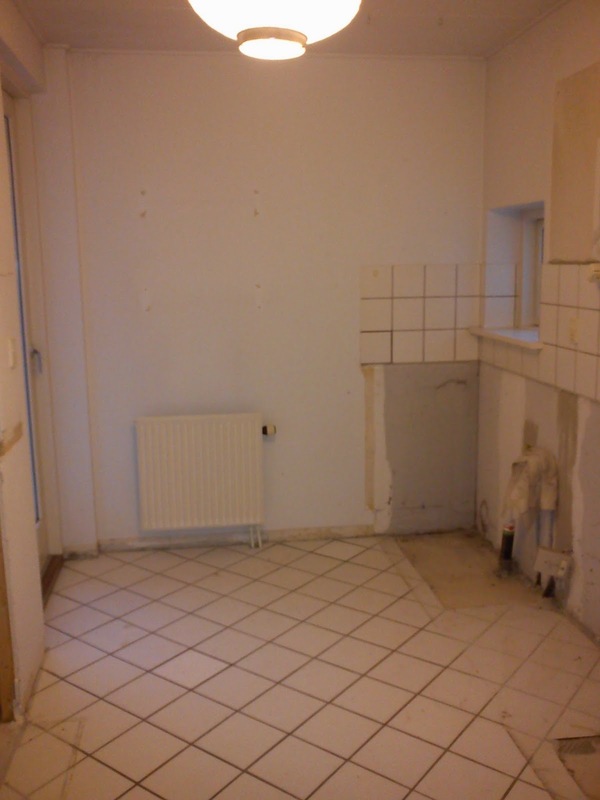 There are now 11 days left, before my old kitchen disappears forever !!! 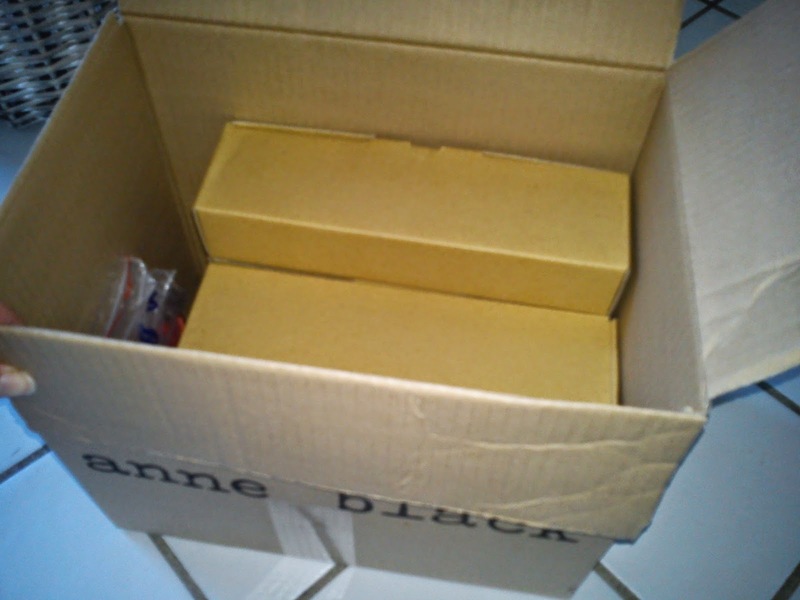 The first parts of the new kitchen is actually already arrived in a cardboard box, the Anne Black porcelain handles, which I have chosen instead of the standard solutions from the kitchen supplier. 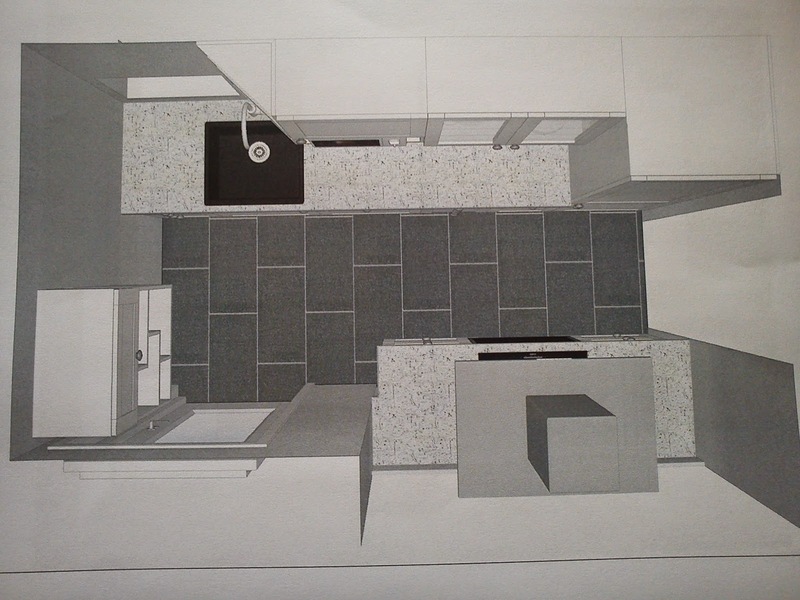 Tonight the electrician also came by to inspect the kitchen, receive a plan of the future kitchen and talk about the need for more electrical outlets for lights in the wall cabinets. The good news is that there is a need to make changes in the electrical switchboard. Mit køkkenprojekt skrider stille og roligt fremad. Der er nu 11 dage til, at mit gamle køkken forsvinder for evigt !!! De første dele til det nye køkken er faktisk allerede ankommet i en papkasse, nemlig de Anne Black porcelænsgreb som jeg har valgt i stedet for standardløsningerne fra køkkenleverandøren. Elektrikeren var ligeledes forbi i aften for at besigtige køkkenet, modtage en tegning over det kommende køkken og snak om behov for flere stikkontakter til lys i vægskabene. Den gode nyhed er, at der ikke er behov for at lave ændringer i husets eltavle. After we spend the night at Bandholm Hotel, my mother and I started our one-day trip around Lolland and Smålandsfarvandet, where a selection of small islands is located north of Lolland. The only way to come out to the small islands is to take a ferry. And as usual you buy a return ferry ticket on the way over to the island, as they are not selling any tickets on the way back from the island ! Because people returning from the island would have needed to take the ferry to the island in the first place ! 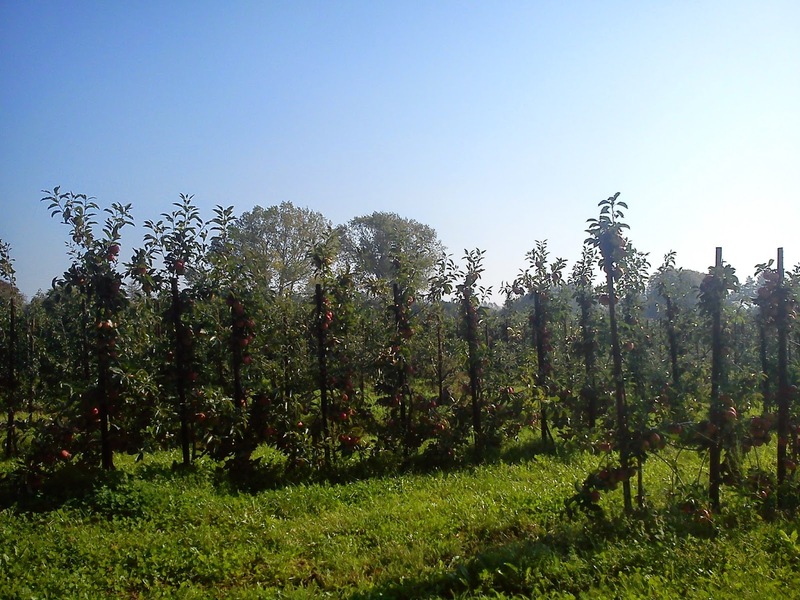 We went to the island of Fejø, which is one of the Danish apple islands, where you can see field after field full of apple tree, which are booming the wonderful apples at this time of the year. I think it could be very nice to visit the island during Spring time, when all these apple trees are standing in full bloom. 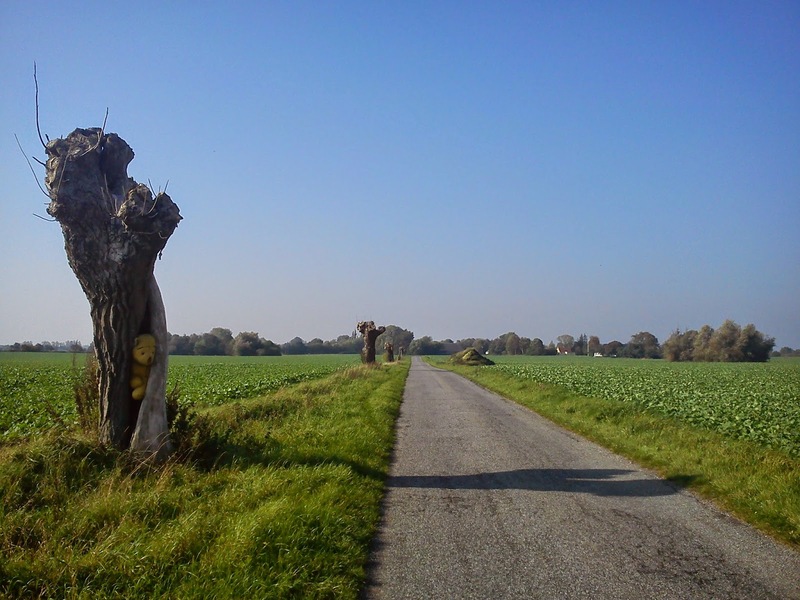 I have never seen so many apple tree in one Danish location beforehand. Every little house having apple trees in their gardens were having a garden booth with a honesty box, where you could buy freshly picked apples. And at every apple field we were passing by big tree boxes for transport of picked apples were lined up. 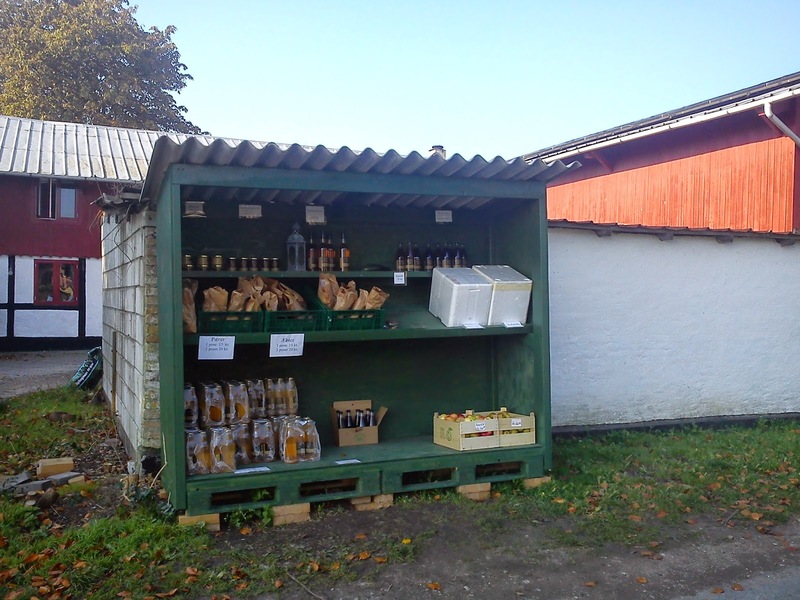 I did some "souvenir" shopping at Kernegaarden,which produce apple juice, apple cider and liqueur of the apple cider. I am really looking forward to taste all these different apple products. The only thing, which I did not buy was their apple jam, as I found it to be too liquid, when moving the jam glass around. A jam for me should be thick, and it is possible to make a thick apple jam. However, the composition of the apple jam was 79% apples with sugar and spices, so there is not enough solids to make a more viscous jam, if there is no addition of pectin up top. When I wanted to pay for my "souvenir shopping", the electronic bank card system was not working. In all other situations like this, you would have to leave the shop without any of the goods. However, on these small islands/country side area, people are trusting each other, so I got a piece of paper with the bank details of shop and I left behind another piece of paper with my name and phone number. The money was transferred on the first coming bank day, so I can enjoy my "souvenir" having a "good taste in my mouth" ! At one of the booth along the road I also bought a bottle of apple juice and a bottle of plum cordial. When I in June spend some days together with a very good girl friend on the island of Fur, I brought 100 g of some wool made from 78% mohair, 13% merino and 9% nylon as a souvenir for myself. I will be knitting it into a light neck tube using knitting needles in size 12. 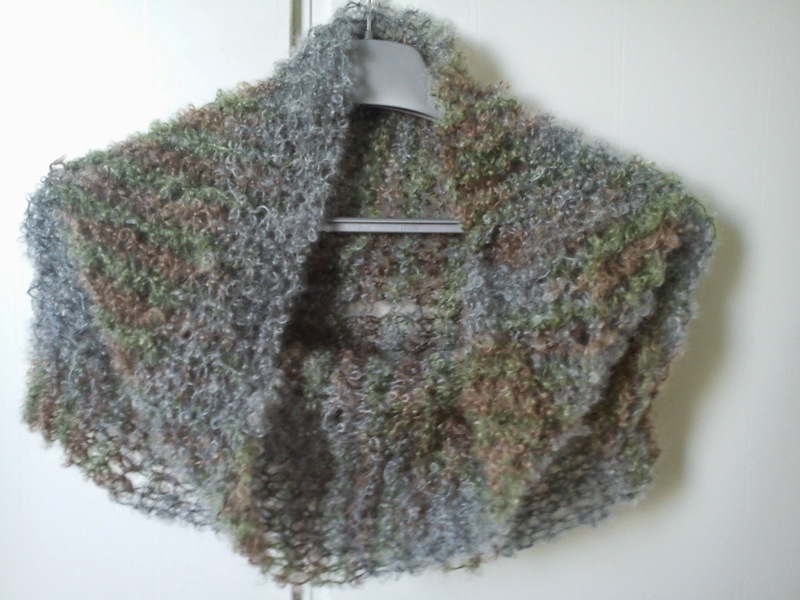 And it is a very simple and easy knitting pattern. Beat 30 stitches up on the knitting needle, each pind is knitted right, until the desired lenght is reached. How much more simple can a knitting pattern be ? The final neck tube will be much more light compared to this neck tube a la Søhesten. Are you making some interesting knitting project with Autumn ? As birthday gift to my mother I gave her a weekend stay at Bandholm Hotel. I find it to be an ideal gift for my older mother (being 79 years old), as she has something to look forward to in advance for a few months combined she is able to share her joy with her surrounding for the upcoming event. As part of the weekend was a three course menu, where we decided to go for the "local menu of Lolland". 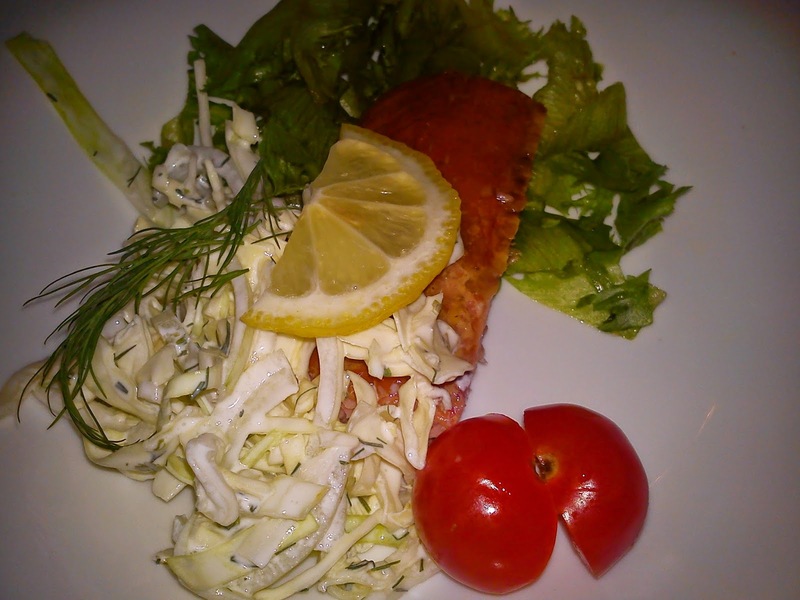 The "interesting" thing was, the waiter only mentioned the specific ingredients in the starter in form of smoked salmon from Fejø with fresh salad, where the dressing was yogurt produced at Knuthenlund. For the rest of the menu nothing was mentioned about specific ingredients from the island of Lolland !!! The salmon was tasting quiet good and the texture was firm, which I like. As main course we were served neck fillet from pork with a good selection of fresh vegetable and rye otto and mushroom sauce. The sauce was tasting excellent, and the rye otto was also quiet good. 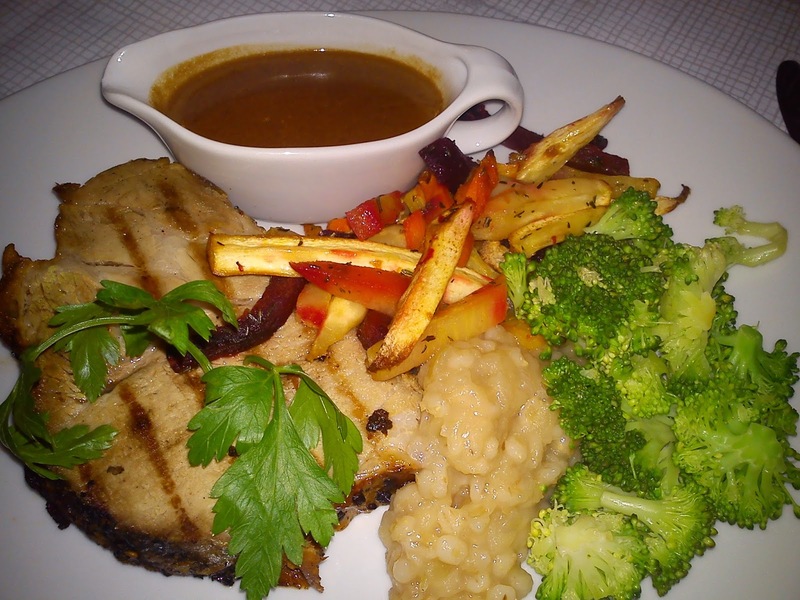 The rest of this main course was more to the plain side, not bad neither very good. And you can not complain about the size/volume of this main course. There was plenty of food. I will give this three course menu three stars, as the dessert was excellent dessert, but there is room for improvement for the actually main course. And I did no really get the idea of "Smagen af Lolland", as only the starter was specific related to Lolland. I think, that I am drinking more tea during Autumn and Winter than during the Summer season, as you are staying inside in cover for the cold and rainy weather. 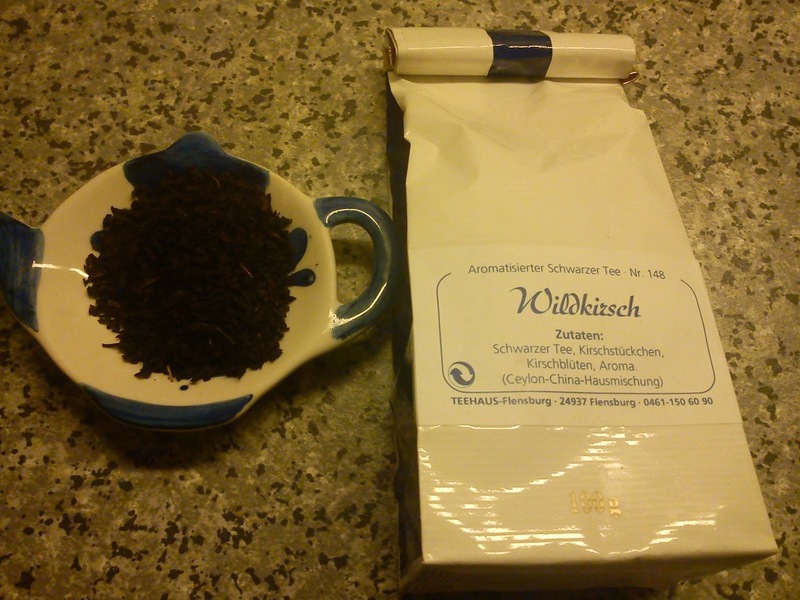 Wildkirsch tea is black tea with cherry pieces, cherry blossoms and flavour. The smell reminds me about the red fruity flavour of bubble gum, which luckily enough is NOT found in the final cup of tea. The cherry flavour drinking the tea is quiet natural. Some how the taste of this tea is reminding me about the classic Danish Christmas dessert in form of rice pudding and cherry sauce. as I am finished with knitting this knitted plaid approx. 9½ month after I started the process. 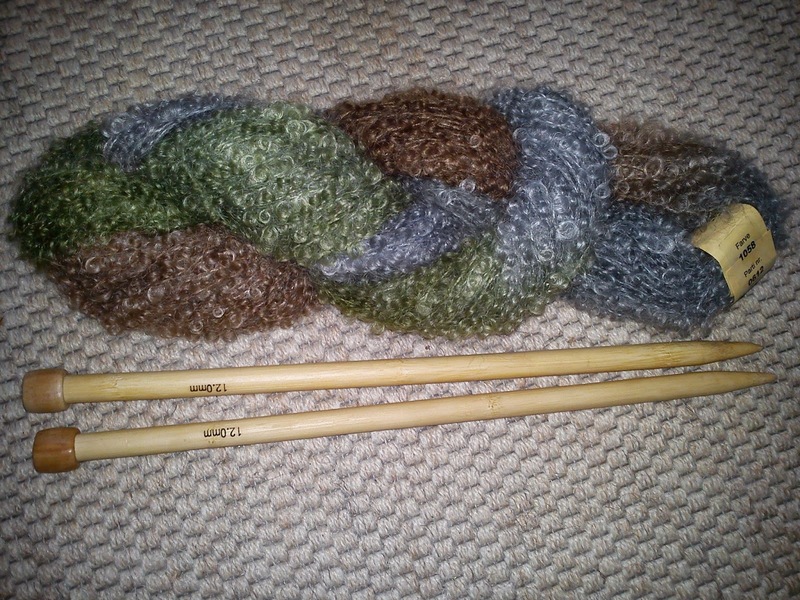 I do not knit a lot during the Summer, as I much more outside rowing or in my garden, which leaves less time for knitting in front of the TV. 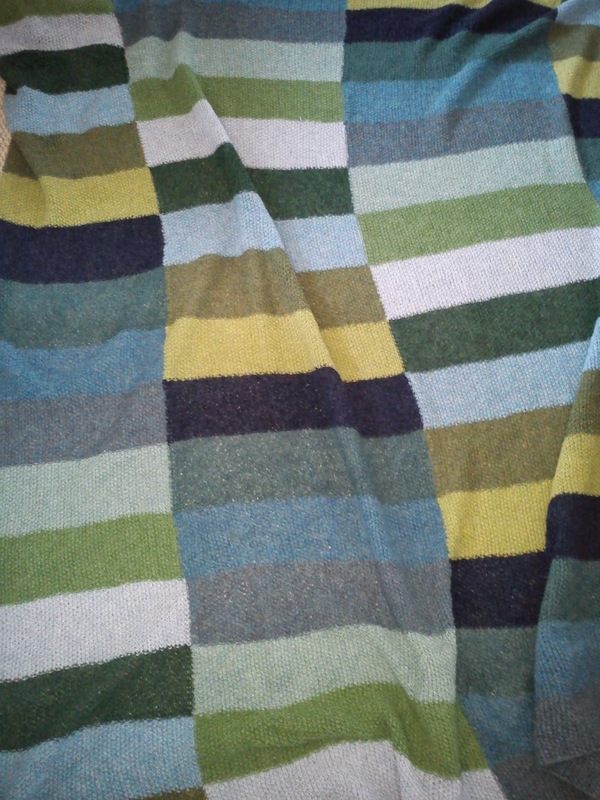 I would it is perfect time, so this knitted plaid will ready to keep me warm during the approaching cold Winter season. The size of the plaid is 170 cm x 160 cm. There is still some wool yarn left, which I am knitting into smaller squares. When I have enough yarn squares from various leftovers, I still saw the squares together into another plaid. 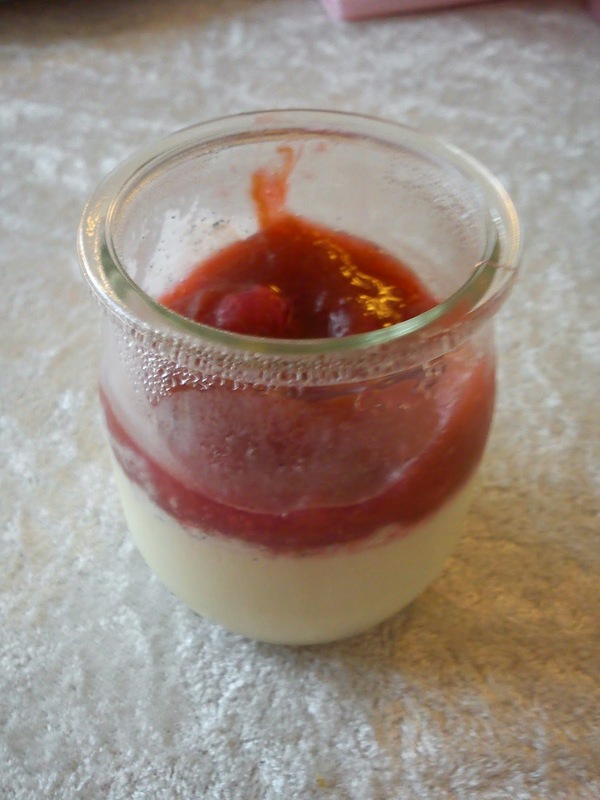 I have reduced the sugar level from this white chocolate panna cotta with cherry sauce, as I found it to be too sweet even for my sweet tooth. The actually sugar reduction was fro 120 g to 100 g sugar, which is giving a much more balanced sweetness, when used together with white chocolate, which is quiet sweet. 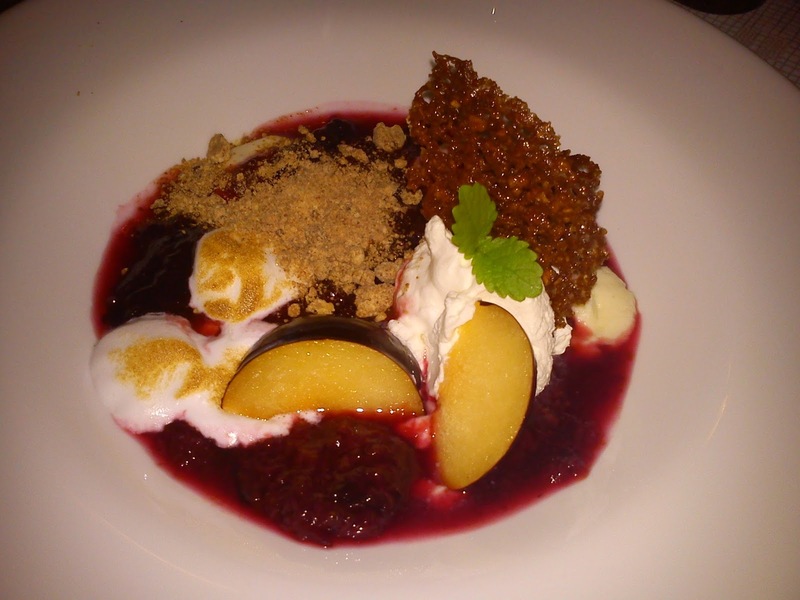 Served the white chocolate panna cotta with fruit sauce for having a more fresh taste. Well, what did I make of changes ? First of all I added into some real dark chocolate together with the cocoa powder. 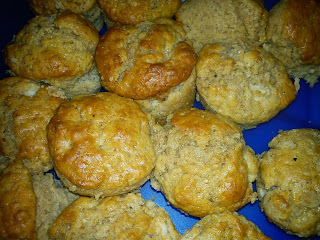 Secondly I divided the sugar into ½ sugar and ½ brown sugar, as I find brown sugar to give more of dark caramel flavour. And finally I replace the orange juice with milk to remove acidity from the taste and hopefully increase the indulgence. Add baking powder and vanilla sugar. Add the eggs and whip. Add milk and whip together. Add the cake flour and whip again. 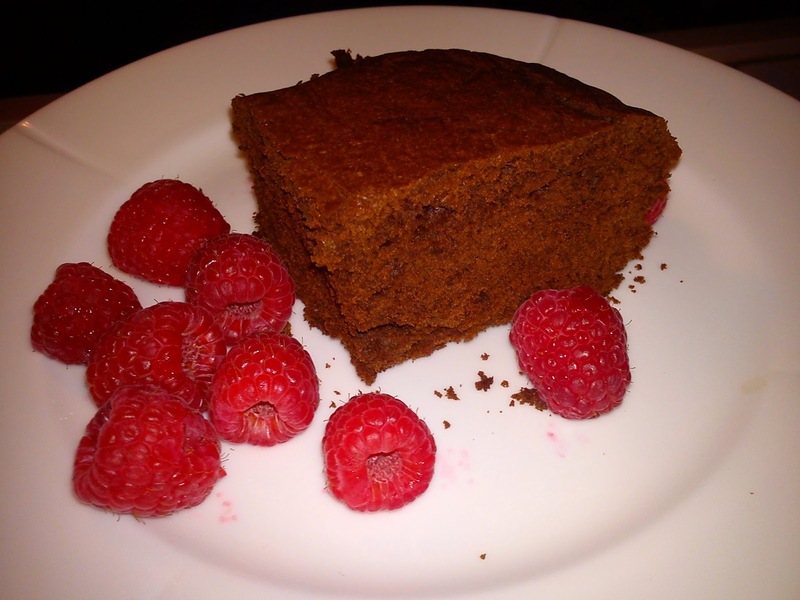 Add the cocoa powder and stir it well into the cake mix. Finally add the melted chocolate and stir it well into the cake mix. Fill the baking form with the cake mix. Bake the cake at 175'C for 45 minutes. and the "winner" is Svane Køkken, specific the model Square white with a rack module from the Y20 series. Why I did choose the suggestion from Svane Køkken ? Certainly not because it was the cheapest deal! Labor charges for installation are very similar between the three different offers that I received. 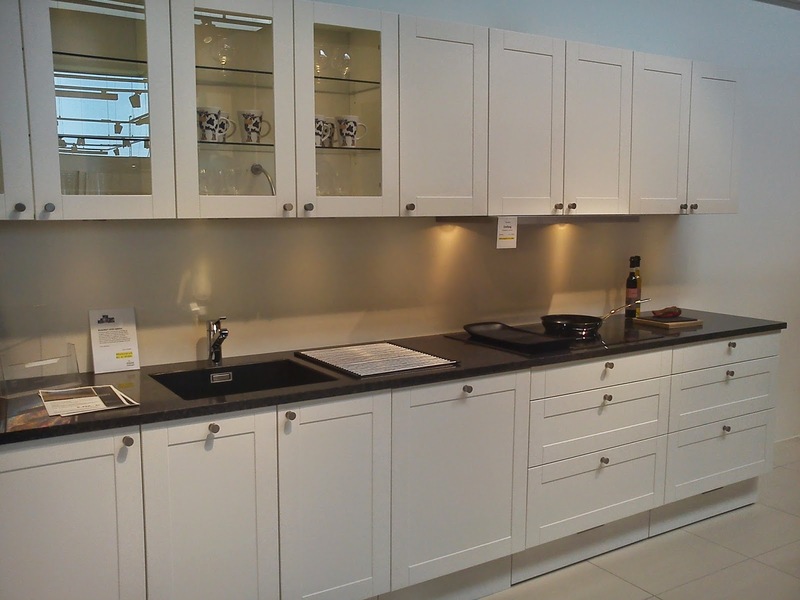 Household appliances and the granite worktop are also costings almost the same for the various offers. 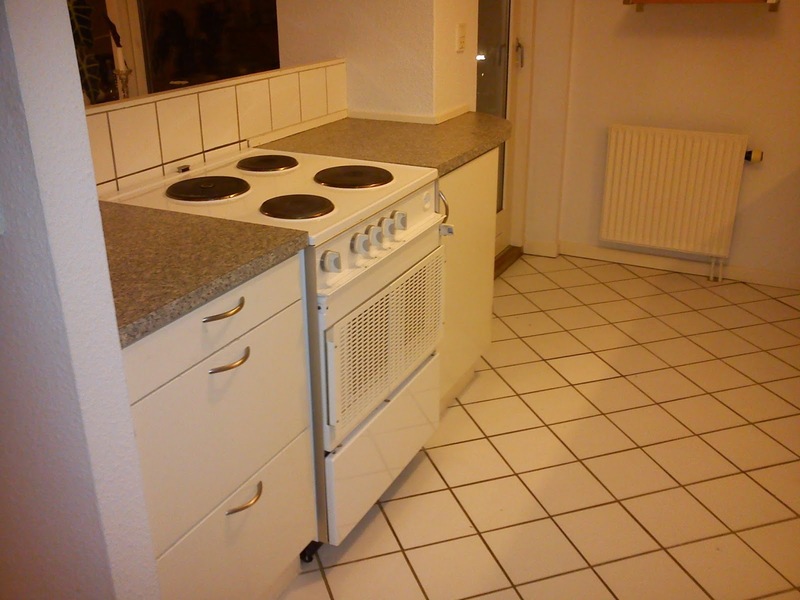 So the real differences is the cost for the kitchen units. 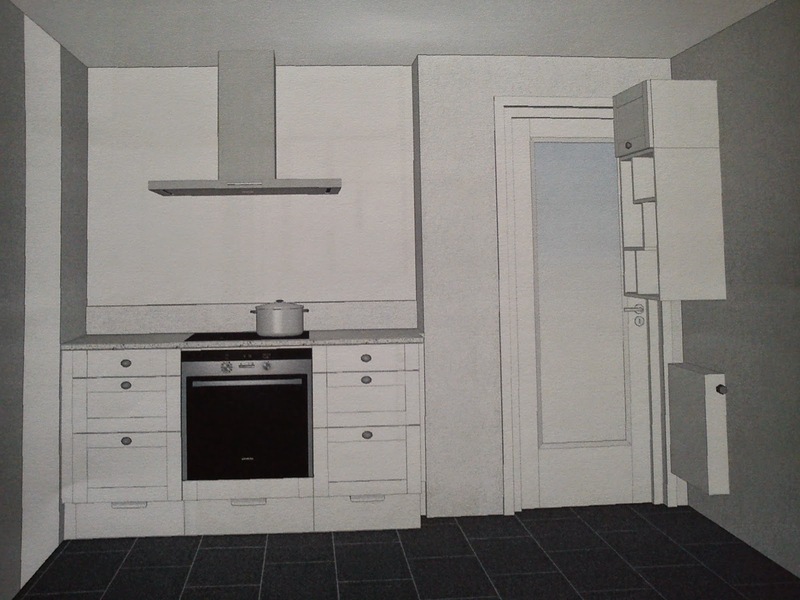 After the first visit to Svane Køkken, a follow-up appointment was made in my own kitchen, where all the measurements for the entire 7m2 of my big little kitchen was measured from floor to ceiling and from wall to wall. 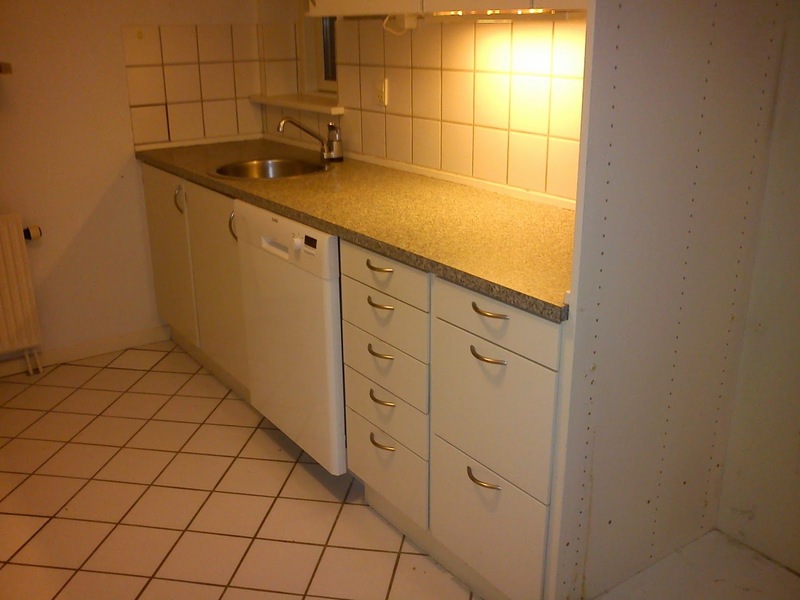 In addition, we had a good discussion about what I like of parts in my current kitchen such as my 5 small drawers being 30 cm width, and what I found problematic such as drawers without sides throughout the drawer height and, therefore things keeps falling out of my jam-filled drawers. 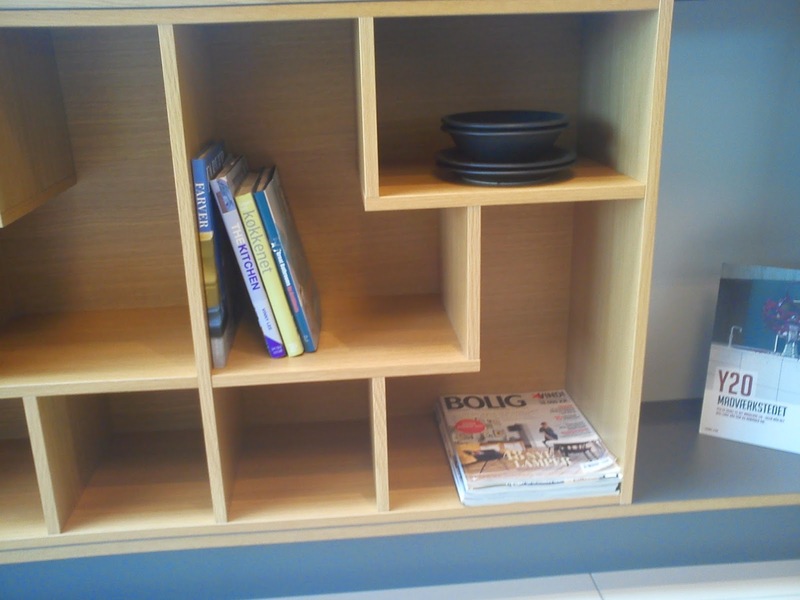 In all the many Swan catalogs I had also seen that you could get a "tall cabinet" in half size to be placed under the table top. What a great thing for storing groceries ! And it seems to be very robust in solid metal and solid flat base, so things will not tilt forward and back for bottoms with net. Elsewhere in the catalogs I saw a rack module from the kitchen series Y20, where a KitchenAid was exhibited in promt and splendor, and another design detail, which I found really interesting. What really appeals to me is that the Svane Køkken offers drawers and cupboards in size from 30-90 cm in width, so you are not stuck in 50 or 60 cm, which is standard size for other kitchen companies. 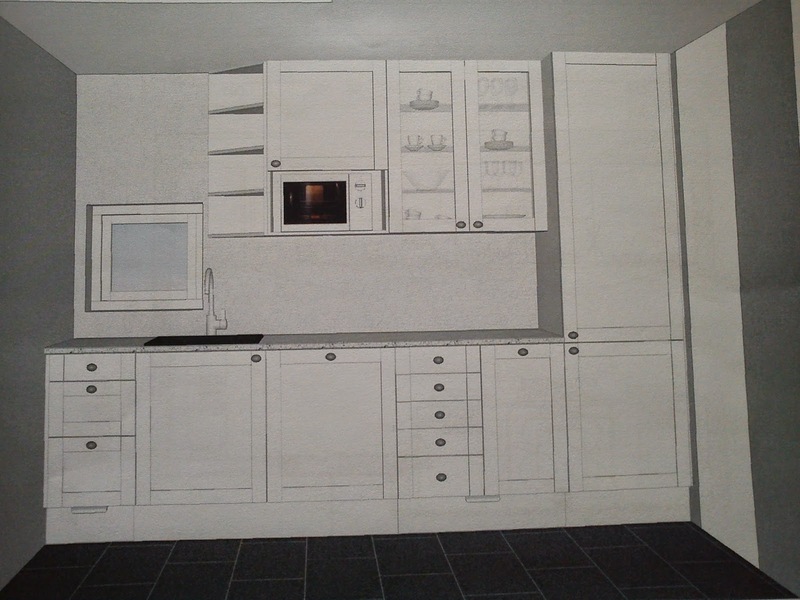 Let me share various drawings from Svane Køkken of my future kitchen with you. The wall cabinet is greater than today, going up to the ceiling. In the wall cabinets with glass doors, the shelves are also in glass with built-in lighting. 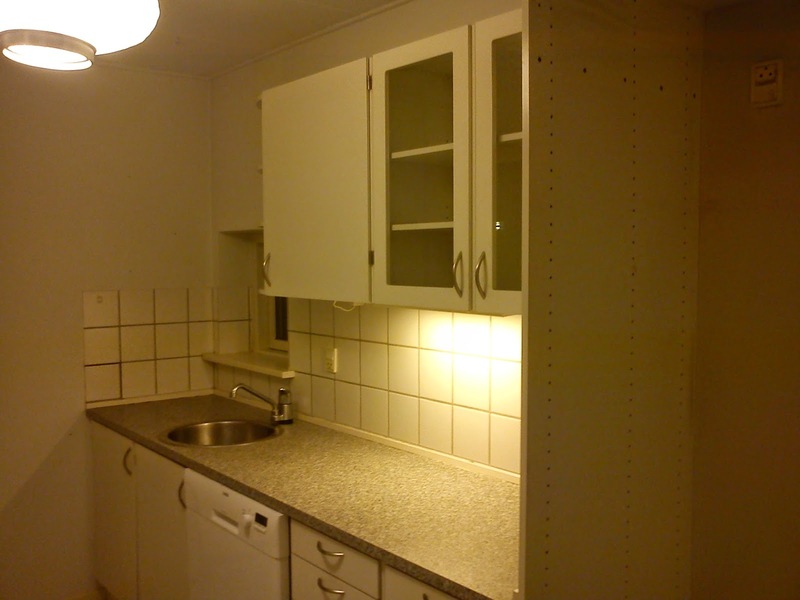 And below the wall cabinets will be light spots. What a lot of light, which I am getting into my kitchen, which seems very dark in the winter. In the base are 2 further storage drawers for all my kitchen stuff. On the end walls in the kitchen I will get a rack instead of the current two shelves from Ikea, where I can exhibit my beautiful kitchen utensils and store my cookbooks locked behind a closed door. On the short side of the kitchen will be hob, oven and extractor as today. 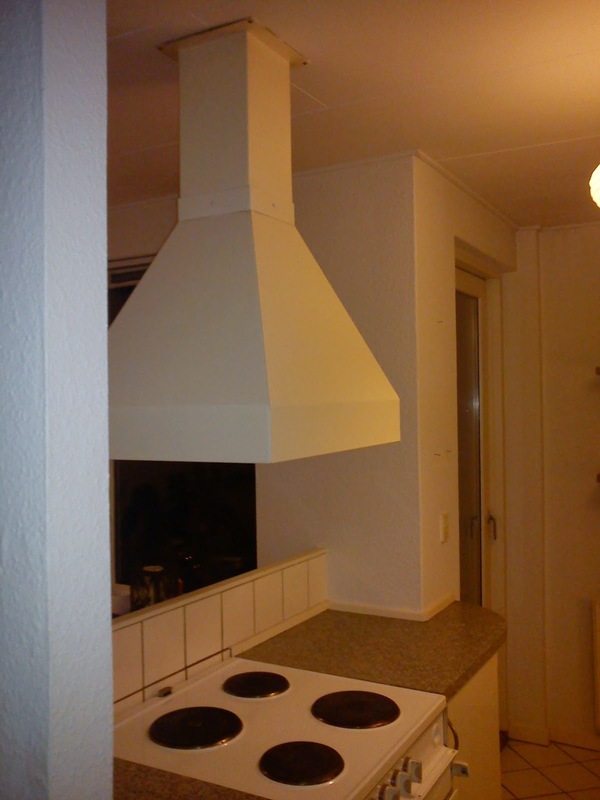 The extractor will be filling less visually than the fume hood. On this side of the kitchen will be plinth drawers across the enitre base. 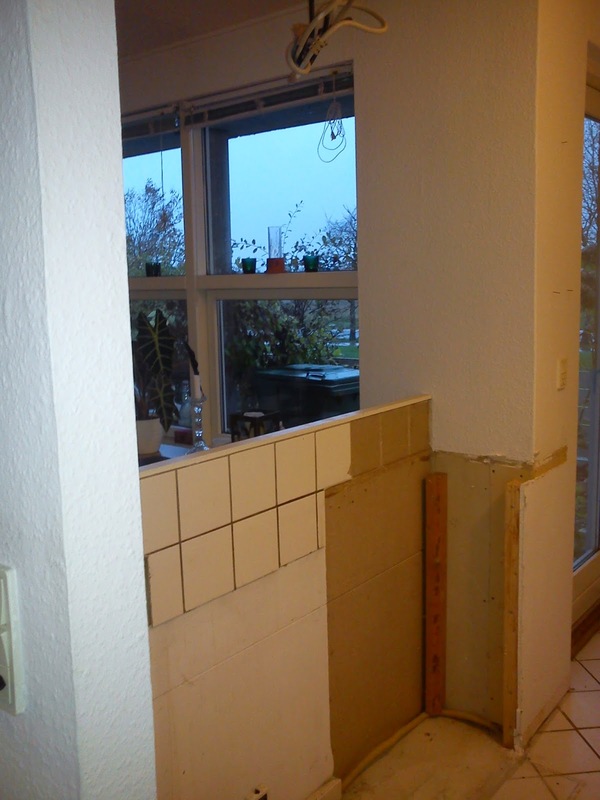 My present kitchen will be removed in beginning of week 44. The bricklayer is then taking control over the kitchen in rest of 44 and 45 removing wall tiles and laying a tile floor. 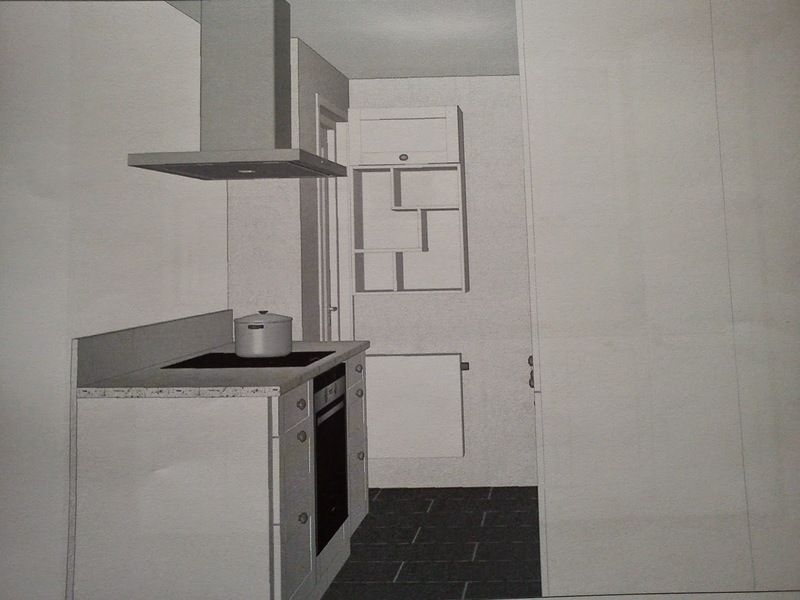 The new kitchen elements and appliances will arrive in week 45, and the new kitchen will be installed in week 46. But before that awaits me a small task of packing down all my kitchen equipment, baking thing and and groceries. I wonder how long this takes will take me ?